You know, I didn't start out looking for it or him. Honestly, I didn't. But some of the best things come to me when I'm not expecting them. And I don't even really like him. Of course, I never met him. But I'd heard enough about him to know that I'd probably not like him. Do you really need to meet someone to know them? He was weak. Not physically ~ at least, I don't think so ~ but character-wise. In my mind, he was what an author would describe a character in their book as having a "weak chin". 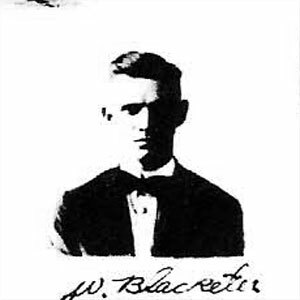 This is why when I found the U.S. Passport Application on Ancestry.com for my grandfather, James Wesley Blacketer, I was both excited and hesitantly anxious, for given the date of the application, I knew what was on the second page. However, I was slow to click the arrow button to advance to the next page. Why? Well, of the things I'd heard about him, he didn't seem to make the right choices in life. His children didn't think much of him. His second wife didn't think too much of him either. And what his first and third wives thought of him? Well, that's lost in time somewhere. I mean, it's sad when the only good thing some of your children can say about you is that, "When Mother would take us over to visit with him after the divorce, he was always very happy to see Mother. I think he really loved Mother." And? It surprised me to find out that he had married before my Gran, and may have had at least one child with his first wife. I often wonder about Virginia Leach and their child together if, indeed, that was his child. What happened to her? What happened to the child? Did they survive? Did she and my grandfather divorce? Or did he just simply leave? While growing up, I had heard whispers in the kitchen when my mother's family was over that one of my uncles had been contacted by a woman. And when I say "contacted" I mean she just showed up on his doorstep and when he opened the door, she introduced herself and said, "I think we're related." Not the best way to, um, contact possible relatives. She was of Native American descent and explained that a man by the same name as my grandfather was her father, too. And that he'd lived on the reservation for a while. But? It makes me wonder about Virginia Leach and her one child that I know of. Was this child the one who showed up on my uncle's doorstep so long ago? Why didn't anyone pursue this relation? Sure, the thought of it was scandalous and their father had been a louse of a husband and father, but was that her fault? Of course, I don't know if any of it is true. For all I know, he could have wives and children everywhere along his timeline. But I know for a fact my grandfather was married to a Virginia Leach because I have their marriage record. I know for a fact that he was supporting his wife Virginia Leach and a child when he filled out his World War I Draft Registration Card. And I was contacted by a Davis cousin researcher. [Our common ancestor being Andrew J. Davis whose daughter Estella Cordelia married a Mr. Smith and their daughter married my grandfather's father Harrison Blacketer.] And in an email to me she said years ago she'd been in contact via snail mail with a descendant of my grandfather's younger brother, Maurice, and that she thought that descendant could shed some light on the matter. I've not been able to find her, but I'm hopeful of finding someone with a part of this story. I'm far from done with researching. In fact, I've only just begun. But getting back to my grandfather, he committed suicide in 1951. I feel bad for him that he thought life was so bad that the only option left for him was to end his life. Did he have regrets about the decisions he had made? Did he think the effects of his bad choices in life would fix themselves if he were no longer alive? Or that they'd just disappear? Or had he been hurting so much that he just couldn't take it anymore? "He was always keen on making children just not keen on taking care of them." That's the motto his children always laughingly said about him. It was always a laugh laced with sadness. You know, one of those moments where if you don't laugh, you'll cry. That's his legacy that he left behind. So, when I found his U.S. Passport Application, I took a deep breath and clicked the arrow to look at the man for the very first time who had been so imperfect, so troubled, so unable to be the man his loved ones needed him to be, and so human. And I kept staring at him with all these questions and feelings tumbling inside me, and I asked of him what many people ask of those who've decided to take their lives, "Why?" Unfortunately, he didn't reply. But, at least I had a face to the few facts, to the few stories, and to the many rumors I have of him. And you know what? His chin looks a little weak. But I really like his bow tie. Not many men can pull that off. Ancestry.com "U.S. Passport Applications, 1795-1925." Database and images. Ancestry.com. http://search.ancestry.com/Browse/view.aspx?dbid=1174&path=Passport+Applications%2c+January+2%2c+1906+-+March+31%2c+1925.1920.Roll+1307+-+Certificates%3a+71376-71749%2c+21+Jul+1920-21+Jul+1920.149&sid=&gskw=James+W+Blackster : 2009.
great story, great picture, great bow tie! Awesome job! Yes, we don't have to like our ancestors to still tell their stories. Glad I helped to inspire you. Thanks, Lisa! It's hard to not judge. I think it's human, though, I do have compassion for him because it seems he was a very troubled man. Caroline, you are a good storyteller. I was in suspense with you as you waited to click the arrow that revealed his picture. His face in that kind of half-silhouette form looks not only sad but grim. Kind of unyielding. A little scary. I'll bet he had a number of internal demons. I wonder how HE was cared for as a child.... And I can relate well to the scenario of a kid hearing whispers in the kitchen. That happened to me a lot as a child. The feeling of grown-ups protecting us from some terrible, terrible secret. Which today we would probably not think so terrible at all, for today human failings seem to have partly medical explanations rather than purely moral ones. Mariann, thank you, and I agree with you. I think the photographer captured so much about him in this simple photo. And? The best (and worst) stuff can be overheard in the kitchen. Joan, I agree with you. That question is never far from my mind. But then I wonder what my descendants will be asking of my long ago actions. I hope I answer them. Or I hope they don't ask too much about the stupid decisions and choices I've made. I've plenty of those. Hopefully, they'll concentrate on the 'good stuff'. I can only hope. Caroline, You are a great writer...an enjoyable read. I have a couple of great grandfathers who appear to have possessed the same mentality as James Wesley. Thank you, Melinda! I've some less-than-stellar great grandfathers as well. And my other grandfather, Big Paw Paw, was pretty flawed too. Oh well, their humanness make for great storytelling in my opinion. Inappropriate comments will be deleted. So keep it clean and be nice. Take a look around. Read a few stories. Laugh. Cry. Shake your head in disbelief. [*snort* I do it all the time.] For these are my family's stories. Search my blog for surnames, locales, etc. Maybe we're related! Did you miss a story? 'Family Stories' now available for your Kindle here. Be a part of the "FS Gang"
Family Stories by Caroline Pointer is licensed under a Creative Commons Attribution-Noncommercial-Share Alike 3.0 United States License.